It’s true. I’ve seen several new specialists lately and am waiting to see a few more. This is a good thing, because it means that after years of trying to politely convince my doctors that there are other things going on, I’m finally getting somewhere. I don’t yet know exactly where that somewhere is, but I’m happy to be on my way all the same and I’m thankful for the understanding and committed doctors who are helping me get there. But it’s still hard. I’m tired of waiting months for appointments to come up. I’m tired of playing trial and error with new medications. I’m tired of day in and day out just not feeling well. I expressed this frustration to my doctor although I knew there was nothing he could do about it. What he said, however, actually did help. It was the perfect thing to say. There was no pressure that I put on a brave face. There was no expectation that I be upbeat and optimistic all the time. There was no dismissal with false hope or empty consolation. Instead, there was awareness of the “chronic” part of chronic illness. There was permission to be realistic. There was understanding that I was weary and there was validation that even though sometimes it seemed as if I was stuck in one place, weighted down by my illness, I was actually still moving forward. And because of all that I also felt encouraged. I was doing a good job. I could keep doing that. It was exactly what I needed to hear and I can’t help but think that maybe you need to hear it, too. Maybe, like me, you are facing a chronic illness or disability. When you feel like you’re running around in circles searching for a diagnosis, you are advocating for yourself. When you struggle through difficult treatments and procedures, you are giving yourself a chance at a better future. And when you find yourself facing a feeding tube, a wheelchair or any other medical device, you are working within your limitations to be as well as possible and live a life as full as possible. You’re doing a good job. Maybe you love for and care for someone with a chronic illness or disability. When you are breaking down the walls of your comfort zone in order to learn to care for your loved one, you are working to accept your new normal. When you are putting in hours of planning and preparation to help your loved one carry on with life as normally as possible, you are proving that a challenging life can still be a meaningful one. When you set aside your exhaustion, pain and fear to help your loved one through those feelings of their own, you are teaching them how to be resilient. You’re doing a good job. Sometimes we get defeated. Sometimes we are angry at our circumstances and feel sorry for ourselves. Sometimes we compare ourselves to others and get jealous of those who appear to have it easier. And that’s all okay, because other times our spirits triumph. Other times we choose to laugh instead of cry and choose to be grateful for what we do have instead of bitter about what we’ve lost. Other times we reach out and take everything we’ve learned through our struggles to help someone else face their own. So don’t be afraid to give yourself some credit and acknowledge your own strength. Don’t be afraid to give yourself the affirmation that you need. Whether you are thriving or simply just surviving, you are doing your best. Further to Matilda’s and your comments about the trap of comparing your new normal with your former self, try not to feel patronized when friends and family cheer you on over little things that, compared with your own expectations, may not feel like much of an achievement. I am sure that is not the intent. It is hard for people to see their loved ones experiencing severe illness especially hard-to-diagnose or incurable or mystery-symptoms. They feel powerless and just want their loved one to feel better if only there were something they could do to help. Those who love us stick with us through the bad as well as the good. They see us at our worst and therefore have a good gauge on how far we have come. So when they ‘patronise’ us over small achievements, they are really celebrating our survival and ability to overcome those ‘worst of times’ while relieving their frustration about feeling powerless by cheering us on. They don’t compare our new selves with our old selves, but recognise our progress in our new lives, appreciating our ‘new normal’ – celebrating that is a way of expressing support and love. Don’t see it as ‘belittling’ but as a barometer by ‘those in the know’ on what a good job you are actually doing! Thank you so much Catherine. I follow you from Lisbon, Portugal. I have so far been diagnosed with psoriatic arthritis and fibromialgia. You’re really doing a good job! Thanks Soraia – I love love love seeing blog views from outside North America so without even knowing it you have brought me quite a bit of delight! I’m sorry to hear about your new diagnoses and I’m even more sorry to know that you are facing chronic pain. I wish you good distractions and lots of laughter in spite of that pain. Like you, I’ve seen a phalanx of doctors. I’ve heard platitudes, I’ve been told I’m not sick and I’ve had several give up entirely. I’ve never heard a doctor say this. Frankly, in lieu of a cure, this is probably the next best thing. 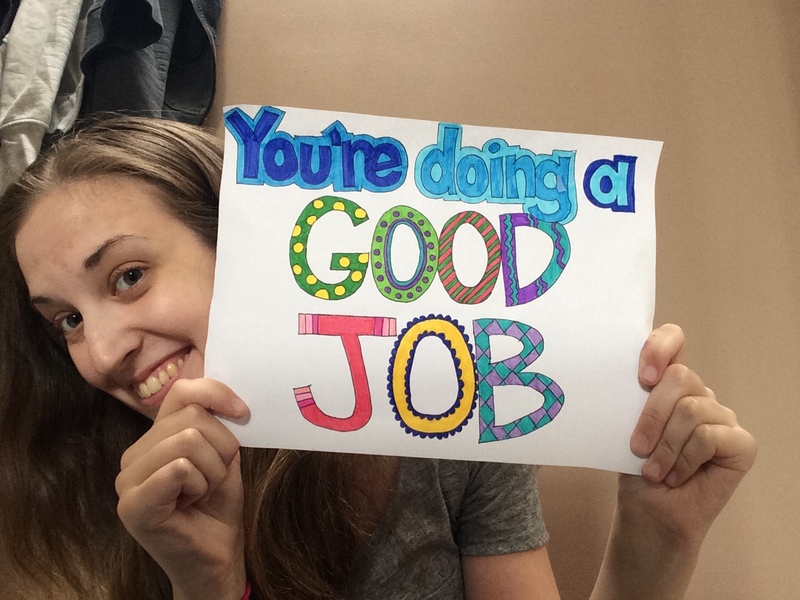 And yes, you are doing a good job. Thank you for this. Thanks, Jeff! I hope that one day a doctor will tell you something that you need to hear! Thank you for this article. It was a good reminder to me, as the doctor of mostly chronically and metabolically ill patients to affirm their journey and their strength. Thanks for this comment, Lee! It gives me hope to know that there are doctors out there open to understanding their patients better. And as a patient, I know that chronic illness is really not all that exciting for most doctors because there’s no easy fix and we don’t just get better, and I know it must be discouraging for doctors to not know how to help us, so I just wanted to say thanks for dedicating your time to us chronic illness patients. I just read this and I’m crying. I’m having such a hard week and I want to say thank you for putting this out into the universe. I am doing a good job. Sometimes I still measure my successes against myself when I was healthy, and I know that’s so unrealistic. I’m also lucky enough to have a doctor, who I’ve been seeing for 5 years, who will ask how I’m doing and smile the biggest smile at all the things I’m doing and all the efforts I make to be happy and make a living. You’re right, Matilda, you ARE doing a good job! So sorry to hear it’s been such a tough week and I sincerely hope that next week is even just a fraction easier for you. I fall into that comparison trap of measuring what I can do now to what I can do before as well. Sometimes I feel so patronized or belittled when people are impressed or commend me on doing the smallest things, like visiting for a few hours or going for a really short walk…I used to be able to do actually impressive things! It’s hard to accept the new normal all the time. But I am very glad to hear that you too have a good doctor who understands your situation and makes you feel supported and encouraged! Here’s to a better week! Thank you for this piece! My daughter was diagonosed with dysautonomia/POTS (possibly mitochondrial dysautonomia), which has also helped explain issues that I (along with my mom and sister) have dealt with for years. However, my poor little girl drew the short straw and got the mother-load of symptoms. With it being hereditary and possibly genetic, she is not likely to outgrow it and may possibly be degenerative…though we are working hard to prevent that! Learning to manage the symptoms and misery has been a difficult process, compounded by years of trying to get docs to connect the dots and believe the multi symptom issues. Your blog post was essentially the oxygen I needed to keep pushing and helping my little girl. I also plan to have her read it. I think this kind of “pat on the back” is just the validation and motivator that she needs. It also brings her great comfort knowing there are others. Others with similar symptoms, others with the periodic anxiety, others with the periodic anger and feelings of “why me,” others who are strong and keep on keeping on. Just know that your words have power and you put something SERIOUSLY GOOD out into the universe. Thank you for the encouraging words! I live with Scleroderma. I had a Hematopoeitic stem cell transplant in 2013 at Northwestern Memorial Hospital in Chicago. I remember the 2 long years it took to diagnose me, they were exhausting & frustrating! You are a breath of fresh air! Attitude is half the battle! Keep that smile and continue to never let that disease define who you are! You can read about mine at Scleroderma Hope House on fb. Catherine, I found your story on FB that a friend shared. Have you gotten a chance to research Auto Immune Diseases? I read some where that dystautonomia may have underlying auto immune disease like lupus, Ra, etc….. There is a great book called “Find the Root Cause” by Izabella Wentz, although the book is targeting Hashimotos Thyroiditis, it touches on Auto Immune. There is so much info now on Auto Immune diseases and putting them into remission. Just wanted to share, maybe it will help you:) Heal well! Thanks, Rose. I’ve been tested for autoimmune diseases on at least 3 or 4 different occasions and it always comes back negative. I know that testing is not always accurate, but at this point in time we are fairly certain that all of my problems are due to underlying Ehlers-Danlos Syndrome, which is a genetic collagen defect. Just curious what your IV was for? Also, have you tried Low Dose Naltrexone yet? 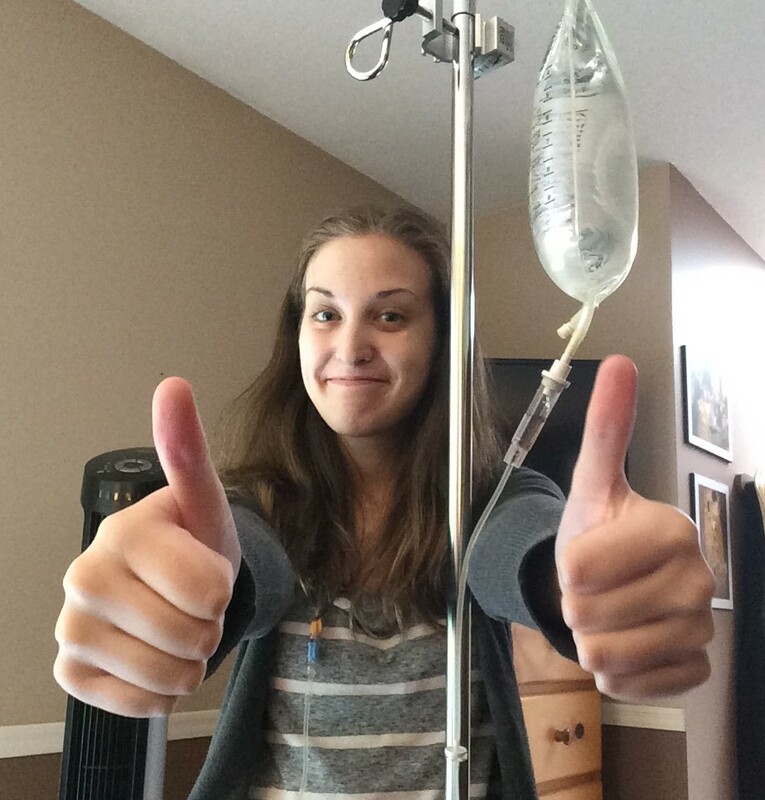 Hi Tamara – My IV in that picture was just normal saline. I run TPN (IV nutrition) every night but I also have normal saline I can infuse during the day if I need a little extra hydration. I have never heard of Naltrexone until you mentioned it but it’s something to look into for sure. Kristin thank you SO much for this comment!! I’m sorry to hear about everything you’re going through – it can sure be exhausting hey? But I’m also happy to know that my words helped to make your day even a fraction brighter. Best of luck and best of health back to you! I really love this. No one has ever said this directly to me, and I think it would really help. Something that doesn’t depend on change or progress, but instead, acceptance. Thanks. Well then let me be the first to tell you that YOU are doing a good job, Carlin. All the best to you! Thank you so much from sharing your story. you story rally inspired me. I’m someone else who was in tears reading this. I wish I could find a doctor as compassionate and wise as yours! Hi Katje – I will cross my fingers for you that you find such a doctor! I am so grateful that my sister thought to send me to this particular blog. I was tearing up by the end. Reminds me of this great quote I recently heard. “What if good enough was awesome!” You are awesome!!! Hi Wendi – thank you so much for taking the time to share that with me! It means a lot to me knowing that my words have touched someone else. Hope you’re hanging in! Thank you for your time. I do have a question, where can I find specialist for this disease? I have ME/Fibromyalgia. I live in California. I am currently taking Welbutrin for the fatigue, and it does seem to help. But I want to be able to do all I can . Hi Grace – I don’t have any specific resources for you because I don’t have ME or fibromyalgia, and I live in Canada, but I did some quick googling and came across this website that appears to have a database of doctors who treat ME (http://www.cfstreatmentguide.com/doctors-and-clinics.html). I would suggest looking to see if there are ME and/or fibro organizations for the US, or specifically California, because often those organizations will have a list of specialists familiar with the conditions. Best of luck to you! Thank you for this post Catherine. I love seeing your smiling face with your positive message. You have done a good job on that! 🙂 You are so good at crystallising those feelings that we go through between being having concerns dismissed and useless throwaway lines. Your words, “when you find yourself facing a feeding tube, a wheelchair or any other medical device, you are working within your limitations to be as well as possible and live a life as full as possible. ” are particularly pertinent. I hate when people think my wheelchair is something to be sad about when in fact it is the best thing because it has given me some independence back and is a useful tool for managing pain and fatigue. It allows me to do things that I otherwise would not be able to do. Thank you Jodie! I am very touched by your sweet words 🙂 I am with you on the wheelchair thing! It’s a new thing for me but the few times I’ve used one it’s allowed me to actually leave the house and go out and do the things I want to do. It’s almost been harder for other people in my life to adjust to than me! Anyway I’m glad this post resonated with you and I hope you are hanging in okay! Excellent blog topic- well done. Chronic illness and/ or pain and particularly any resulting disability is life altering and we have so much to contend with. A seemingly small acknowlegement of how well we are doing carries a lot of weight.